In response to the overwhelming rate of youth unemployment in California, which has reached an all-time high of 26.9 percent, Los Angeles County Supervisor Don Knabe, in a joint motion with Supervisor Zev Yaroslavsky, introduced a motion today that would create employment opportunities for at least 2,200 economically disadvantaged youth Countywide. 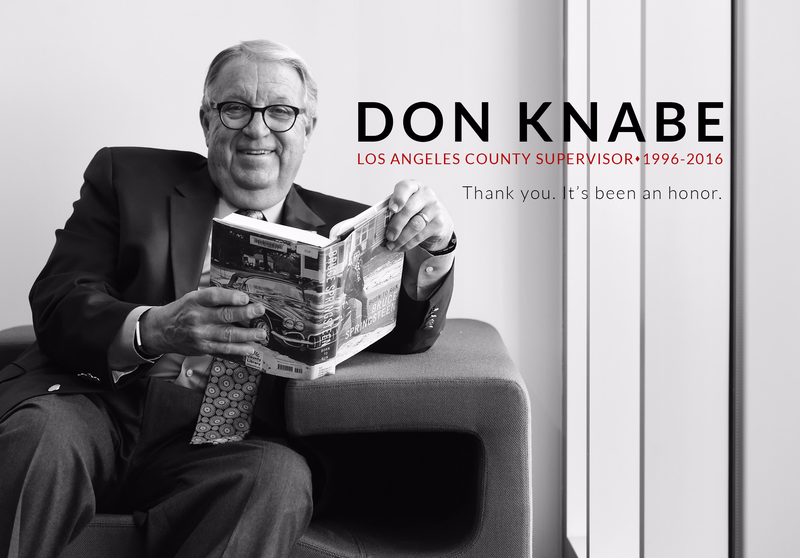 Through Knabe’s advocacy efforts, the County has provided funding that created almost 17,000 employment opportunities for young people in the past five years. The motion will be voted on at the Board of Supervisors’ next meeting on Tuesday, June 28th. Los Angeles County will pursue Federal and State funding to create subsidized employment opportunities for people who are welfare eligible and former foster youth, Supervisor Don Knabe announced today. Los Angeles County will also collaborate with local Workforce Investment Boards and Temporary Assistance for Needy Families agencies in an effort to get people back to work. Last year, Supervisor Knabe’s 10,000 Jobs Program which utilized federal stimulus dollars, created temporary subsidized jobs for 11,000 adults and 15,000 disadvantaged youth. The program became a lifeline for many local companies and prevented people from going on welfare. More than 1,500 people were able to move into permanent, unsubsidized employment because of the 10,000 Jobs Program. In addition to pursuing this funding, the County will send a five-signature letter to Governor Jerry Brown, President Barack Obama and the County’s Congressional delegation urging them to utilize Workforce Investment Act discretionary funds to support projects and urging them for support for funding. In less than a week – absent action from Congress – we will have to say farewell to a Federal Stimulus program that employed nearly 27,000 adults and disadvantaged youth since we implemented the program in Spring 2009. And I cannot understand why this has to happen. Our 10,000 Jobs Program here in Los Angeles County was funded through the Economic Recovery Act’s new Temporary Assistance for Needy Families – Emergency Contingency Fund (TANF ECF). This new fund has proven to be one of the Act’s greatest successes in creating jobs and stimulating the economy. It created subsidized employment for thousands of people, created opportunities for private businesses and non-profit organizations to conduct business in the middle of a deep recession and reduced both the State and the Federal government’s costs to provide welfare benefits. Policymakers in Washington have told me that this program has been the most effective use of the Stimulus dollars they have seen. Business owners have told me that, without this program, they wouldn’t have been able to stay open. People who have gotten jobs have told me that earning a paycheck and taking care of their family has been much better than collecting a welfare check. In fact, many adults employed through this program have transitioned to permanent, unsubsidized jobs. To me, that is proof alone that this program is a success. We just need Congress to take action and extend this program. In all, I have not seen any downside to this whatsoever. That is, until next week, when thousands of people will be once again out of work. I expect most of them will be seeking welfare benefits again, at a significantly higher cost to state and federal government. Does this make any sense? I don’t want to say farewell to a program that has done so much good for so many people. If Congress does the right thing, we could keep these folks working, and employ more. And we could save taxpayers money. The Congressional Budget Office estimates that if TANF-ECF is continued into the next federal fiscal year, it could reduce Food Stamp costs by roughly $170 million due to its positive effect in increasing the income of poor families. So I respectfully ask my friends in Congress – both Democrats and Republicans – what are you waiting for? Please take action to reauthorize the Stimulus funding that made the 10,000 Jobs Program such a great success. You will keep people working, you will create more jobs and you will keep the economy moving closer towards recovery. The 10,000 Jobs Program will be shutting down next week, if Congress does not act to reauthorize the federal stimulus program that made it possible. An estimated 7000 people will lose their jobs as a result. “This program was made possible by economic stimulus dollars and has created jobs for thousands of people, helped businesses and non-profit organizations and actually reduced both the State and the Federal government’s costs to provide welfare benefits. It would be a tragedy if Congress let this program come to an end,” said Supervisor Don Knabe. The Economic Recovery Act created a $5 billion Temporary Assistance for Needy Families (TANF) Emergency Contingency Fund (ECF). A provision in the Fund made it possible to utilize it for subsidized employment. This enabled Los Angeles County to create the 10,000 Jobs Program, which resulted in nearly 27,000 subsidized jobs for 10,500 adults and another 16,500 disadvantaged youth. These subsidized jobs have helped private businesses and non-profit organizations in the middle of a deep recession. Nearly three-fourths of all subsidized employment placements have been with the private sector employers. Absent action from Congress next week, TANF ECF will expire on September 30, 2010, resulting in the loss of jobs and income for 7,000 adults in Los Angeles County. Los Angeles County Supervisor Don Knabe will be joined by Congresswoman Jane Harman, Torrance Mayor Frank Scotto, Redondo Beach Mayor Mike Gin, Hermosa Beach Mayor Michael DiVirgilio, and Manhattan Beach Mayor Mitch Ward at a press conference on Thursday, August 12 to highlight the success of Supervisor Knabe’s 10,000 jobs program and the need for the federal government to extend its funding to get Los Angeles County residents back to work. On March 3, 2009, Supervisor Knabe introduced the 10,000 jobs program, which utilized almost $200 million in federal stimulus funds to create temporary subsidized employment opportunities through the South Bay Workforce Investment Board, resulting in over 11,000 jobs in private, public, and nonprofit businesses across LA County. Los Angeles County will soon be expanding its Summer Youth Employment Program, Supervisor Don Knabe announced today. The Board of Supervisors unanimously approved a motion by Supervisors Knabe and Zev Yaroslavsky to significantly increase the number of youth eligible to get a summer job. The expanded program could employ as many as 15,000 youth throughout the County. State rules allow for local governments to utilize American Recovery and Reinvestment Act (ARRA) funds to provide summer youth employment for a specific group of qualifying young people, including those in CalWORKs families, in foster care or emancipating from foster care. It is estimated that the County could draw down as much as $30 million in federal funds to create the 15,000 summer jobs. The expansion of this important program is made possible by the successful partnerships that the County already has in place. Just over a year ago the Board of Supervisors approved a plan to develop employment opportunities for up to 10,000 County residents, utilizing American Recovery and Reinvestment Act (ARRA) funds. As a result, an unprecedented collaboration emerged between Los Angeles County and the Workforce Investment Boards across the County, and yielded employment for over 11,000 adults and youth. There is a tremendous need for our youth to be meaningfully engaged in positive activities in our communities, and employment is vital to that experience, said Supervisor Knabe. We will continue to take full advantage of every opportunity to provide summer jobs to thousands of young people, which for many is their only chance to learn and practice the skills needed to transition into a self-sufficient adulthood. Click here for more information or to apply visit the County’s Summer Youth Employment Program website. The Los Angeles County Board of Supervisors recently approved a motion to provide $250,000 for the 2010 Los Angeles County Arts Internship Program. The program is for Los Angeles County-based nonprofit performing, presenting and literary arts organizations interested in mentoring an undergraduate college student for ten weeks during summer 2010. The guidelines and application for the program are now available on the Los Angeles County Arts Commission’s Web site. The deadline to submit an application is Wednesday, April 7, 2010. Grants of $2,500 to $3,500, depending on organizational budget size, to be used to pay interns are awarded to successful applicant organizations. Only arts organizations that possess 501(c)(3) status are eligible for the program, including municipal arts agencies and municipal performing arts organizations. Organizations with budgets over $1.5 million are required to provide a $500 match. Organizations with budgets over $4 million are required to provide a $1,000 match. The County of Los Angeles will host centers within a number of its facilities to assist residents who have questions about the Census, need help in filling out their Census forms, or need a Census form. Questionnaire assistance centers will be staffed by Census representatives to answer questions regarding the Census form. Be Counted Sites will provide residents with a new Census form if they have lost their form or never received one. Hours vary by location, and some sites will serve only as a questionnaire assistance center or a Be Counted Site, so residents should call before visiting. Services Department will provide assistance at 21 of its offices to clients already visiting those facilities.